Two Australian retail chains have removed video game Grand Theft Auto V from sale in its stores, following complaints about the depiction of violence towards women. "To see this violence that we lived through turned into a form of entertainment is sickening and causes us great pain and harm." It goes on to say that games like GTA 5 are "grooming yet another generation of boys to tolerate violence against women". A rival petition was launched soon after, urging the stores to continue sales. "This game may allow you to kill, hurt, bash and shoot anyone not just females and this game should be on the shelves all over the country. It's made for adults not children, we have the right to buy games despite their content," said Brett Herbert, who launched the petition. Jim Cooper, general manager of corporate affairs at Target, said that the decision to withdraw the game had not been taken lightly. "We've been speaking to many customers over recent days about the game and there is a significant level of concern about the game's content," he said in a statement. "However, we feel the decision to stop selling GTA 5 is in line with the majority view of our customers." Target Australia posted on its Facebook page the news it was withdrawing the game and immediately received thousands of comments, many of them criticising the decision. Kmart also decided to pull the game - both it and Target are owned by the retail group Wesfarmers. Set in the fictional city of Los Santos, Grand Theft Auto V allows gamers to control three criminals as they rampage through the town committing a series of crimes. It carries an 18 certificate in the UK and an equivalent R18+ rating in Australia. Despite criticisms about its content, it became the fastest-selling entertainment product in history, passing $1bn of sales in the first three days. It has also won 33 awards. 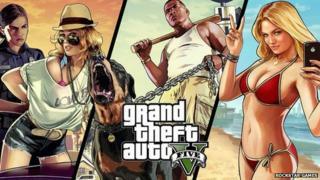 Grand Theft Auto: One of Britain's finest cultural exports?